I can hardly call this a recipe. It’s really something that comes together with a few ingredients that I tend to have on hand, and then I’m quite flexible with the quantities. My chicken thighs were cooked on the bone and they were giant, so I only used two. But if you have frozen ones, they tend to be smaller so I’d add more. It can be different every time, too. Don’t be afraid to experiment – it’s very forgiving. If I have more celery or more pickles or fewer eggs or less chicken, it really doesn’t matter. And if I had some parsley or dill on hand, I’d have been tempted to add it. Capers could have gone in or shredded carrots – in fact all kinds of variations exist. But on this day, for this blog post, this was the combination that came together. I have been mentoring an 11 year old girl for the past few weeks and I bring my lunch while she gets hers from the school. I noticed that she likes vegetables in general and that she’s been a little curious about what I bring. I asked if she’d like me to bring her some to try and she said yes the last time, so I brought this today. She doesn’t like cauliflower, but she loves pickles so she thought it was worth it. She skipped the cauliflower, but devoured the rest. I think the cauliflower is totally innocuous and almost like potatoes, but not everyone agrees. 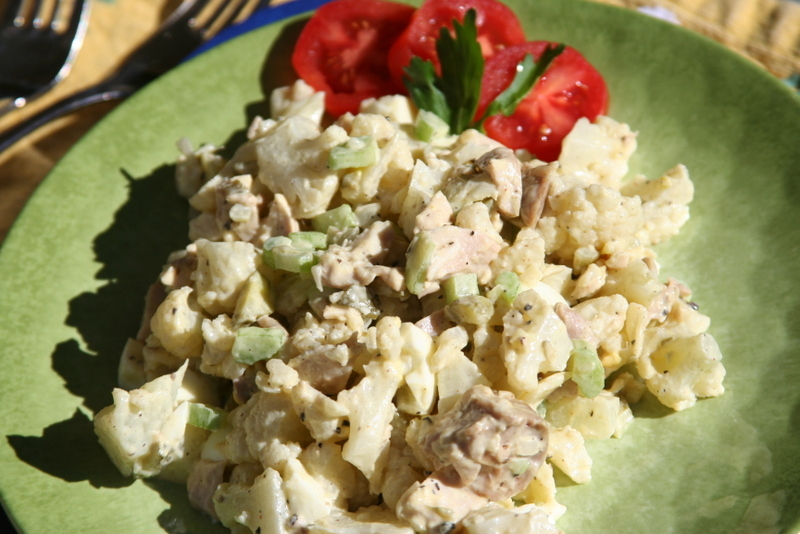 I think it tastes a lot like a traditional potato salad, only it’s not. Give it a try and let me know what you think. Because I use frozen cauliflower, it’s super easy to pull together. No mess, nothing to worry about, and the cauliflower is already blanched so it’s tender. I hope you like it! Take all of your chopped ingredients and place them in a large bowl. Add the mustard and mayonnaise and mix well, ensuring everything is evenly coated. Taste and add salt and pepper. It needs salt, but the pickles are salty and so is the mustard, so be sure to taste first. Once it’s the way you like it, enjoy! I can’t believe that summer is nearly over already! It’s been a crazy few months around my house because, although I only have one child, I do have a number of part-time jobs and projects that take over my time and balancing them with wanting to enjoy the summer with a 10 year old can be challenging. In honor of it still being summer, I will finally post this salad after making it countless times. 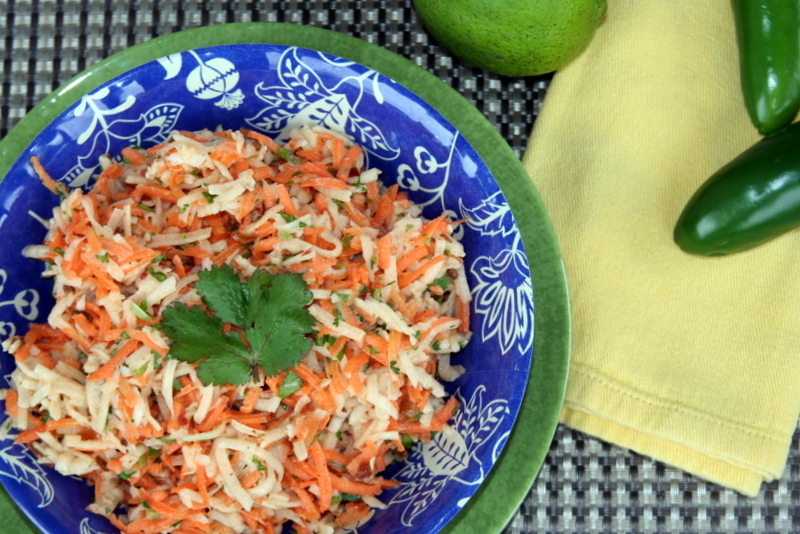 It’s inspired by a chipotle coleslaw that a friend of mine introduced me to many years ago. I lost that recipe, but I never lost the love for the creamy, spicy, tangy sauce. What I love about using carrots here is the sweetness that they bring to the dish. They act as the perfect counterpoint to the spicy chipotle. And then there’s the jicama. If you’ve never tried jicama, I highly recommend it. I should have posted a picture with a whole one so you can imagine it if you’ve never seen it. You find it in the produce section and it looks like a fairly large roundish ball wrapped in brown paper. Think of a big, round potato or turnip with thicker skin that you need to peel. It is, in fact, a tuber from South America and can be cooked, although I’ve found that I much prefer it raw. 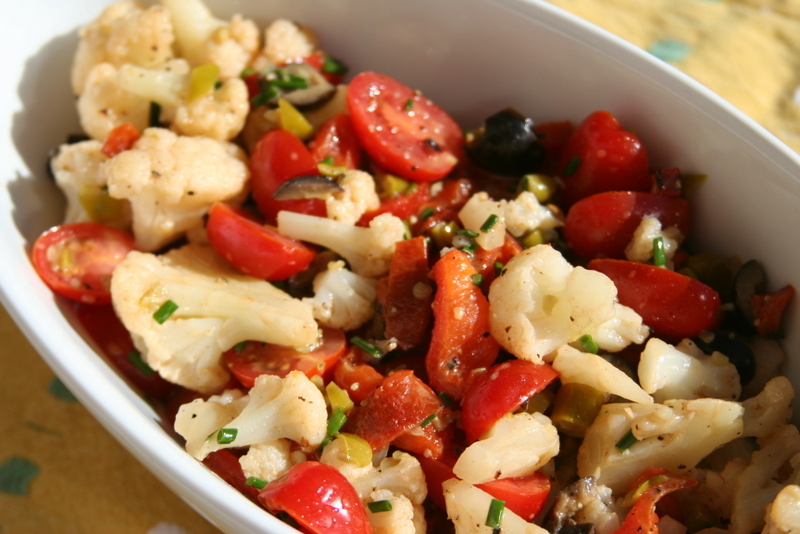 I love it on veggie trays and have even used thin slices as a bread replacement. It’s juicy and refreshing, but not in the way that an orange is. It won’t drip down your chin or make juice or anything, but it will taste delicious on a hot summer day. So this salad…I love it so much that it is among the most frequently made in my house. Crisp, juicy, sweet, spicy, citrusy – you name it, this salad brings it together. It is perfect next to grilled meat of any kind and when I have left overs, I will sometimes throw in a can of tuna or some cooked chicken and call it lunch. You have to be the judge when it comes to adding the chipotle, though. I like it spicy and will vary the recipe depending on my mood. Start with half of what the recipe calls for and then add more until your taste buds are happy. I’ve been known to add quite a bit more. Here’s to the final weeks of summer, friends and BBQs, salads any time, and delicious food! 6 medium carrots, about 1 lb. Juice from 1 large lime, about 1/4 c.
Using a food processor or box grater, shred the jicama and carrots and place in a large bowl. In a small bowl, mix together the mayonnaise, lime juice, chipotle peppers and salt. You can also put the ingredients into a blender or Magic Bullet and give it a whirl. Toss the dressing with the slaw, taking time to get everything well integrated, and then taste to adjust seasonings. You can add more of any of the sauce ingredients to satisfy your taste. Let the flavors meld for about 10 minutes and then taste again, adding a little extra salt if necessary. The time of year is coming when I begin making salad after salad after salad. It’s one of my favorite things to eat and, truth be told, I actually eat salad year round. My son has cringed on more than one occasion when I’ve made salad for breakfast. It’s really not complicated. I just love salads. 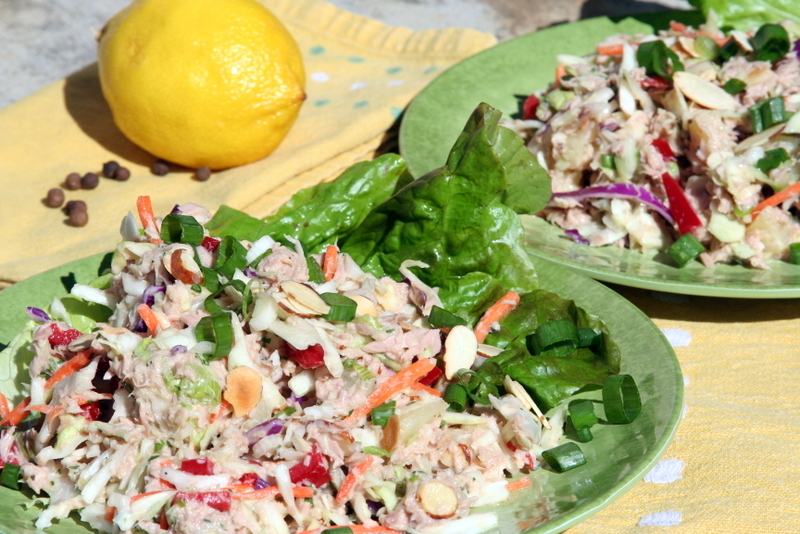 We like to make a giant tuna or chicken salad to serve as lunches throughout the week. It’s also something that I can quickly take for post-workout. I load my salads with so many vegetables that it really satisfies my desire to have a big plate of something delicious, too. Since I’m a fan of savory-sweet combinations, I often throw in some kind of fruit when I’m making one. On this occasion, I added pineapple which also made an appearance in the dressing. If I’d had some coconut flakes on hand, those would have been nice toasted with a touch of salt and maybe a little allspice. I added red pepper flakes to mine when I served it and really appreciated how they kicked up the flavor. So go ahead and experiment – whatever helps get more vegetables on the plate seems like a great idea to me! 1/4 oz. fresh ginger, grated about 2 tsp. 1) In a large bowl, whisk together all of the dressing ingredients. 2) Add all of the salad ingredients, except the toasted almonds, to the bowl with the dressing. 3) Toss the salad thoroughly, making sure all of the dressing is integrated. 4) Allow the salad to sit for about 10 minutes in the fridge so the flavors can meld. 5) Toss again, taste and adjust seasoning, adding salt, pepper, or red pepper flakes as desired.